For many dog owners, training their dog to obey is the least of their worries. After all, most pups are eager to please. However, when a dog isn’t socialized, it can create problems and training challenges for years. 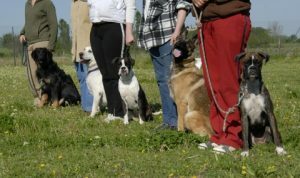 Is it time to consider group classes for your dog? Here are some of the top reasons to choose a group class for your dog. While reading books and researching online can be helpful, having an instructor there to meet your dog and understand your exact issue can help you solve the problem immediately. Even if you don’t have a specific issue yet, maybe one of the other dogs in your class does. Listening to the advice given to other pet parents could help you in the long run. Dogs learn how to behave around other dogs by discovering their boundaries. Any canine who did not get to socialize much when they were younger may struggle with being around other dogs now. Of course, if your dog is not great with other dogs yet, this may be a class to work toward. We can point you in the right direction if you are concerned about your dog’s behavior around other dogs. You want your dog to focus on you first and foremost. Other dogs can have their attention second. Learning this in a group class setting allows your dog to practice focusing on you, even when there are many distractions happening all around them. Please note: This group class requires a 5 private session package before attending group classes. We will focus on engagement, engagement, engagement! Try something new and exciting! Bring your dog to group classes at K9 & You. We help you strengthen the bond with your dog and improve obedience skills. Contact us now to get started.